New York officials crafting policy to regulate shale gas drilling amid unanswered health concerns will likely re-open the process to public hearings, essentially guaranteeing more momentum for the movement that has effectively stalled the industry’s advancement into the Empire State for more than four years. Emily DeSantis, a spokeswoman for the Department of Environmental Conservation, said late this afternoon that agency officials expect to begin a new rulemaking process rather than try to meet a Nov. 29 deadline to complete a regulatory overhaul. The news comes a week after DEC Commissioner Joseph Martens announced that the agency will turn part of the review over to the Department of Health Commissioner Nirav Shah to address persistent questions about how shale gas development and high volume hydraulic fracturing will affect public health in communities where it is allowed. “Given that DEC has said no regulations or final decision will be issued until the completion of Dr. Shah's review, should high-volume hydraulic fracturing move forward, it is expected that a new rulemaking process would be undertaken,” DEC spokeswoman Emily DeSantis said. That process would include at least one public hearing although DeSantis said no timeframes had been made. DeSantis was responding to my question about whether the DEC would meet a deadline of Nov. 29 to issue policy that would allow permitting to begin. The deadline, outlined in the State Administrative Procedures Act, mandates that new rules must be finalized within 365 days after the final public hearing, or the state must file for an extension. The rulemaking process was folded into hearings held last year to assess the environmental impacts of shale gas development. Drafts of that report, called the Supplemental Environmental Impact Statement (SGEIS), have undergone several revisions amid intense public criticism. Since the review began in the summer of 2008, more than 80,000 comments have been submitted. Technically, the rulemaking process, which will produce regulations to govern shale gas development, is different from the SGEIS, designed as a guideline for permitting. While permitting conditions are ultimately left up to the discretion of DEC officials, regulations are set in black and white, and therefore carry more clout for enforcement. While the SGEIS has been evolving since 2008 along with the state’s position on shale gas, the rulemaking process began only last year. The public hearings held for the SGEIS also applied to the rulemaking process, which made it subject to the SAPA deadline. Attorneys from environmental groups pushing for a more comprehensive review of health impacts were encouraged by the latest indication that the DEC will not begin permitting wells before more vetting and evaluation of concerns. Industry representative, meanwhile, were hopeful that the process would not cause long delays. Both NRDC and Earthjustice are among well-heeled environmental agencies that have taken up the policy debate over fracking in New York as signature environmental campaigns with national ramifications. The issue of fracking and renewed interest in onshore drilling in general have raised the profile of domestic energy use and production, along with unanswered questions about air and water pollution, and skepticism related to industry’s exemptions from federal clean water and clean air regulation and hazardous waste disposal laws. Fracking has enabled large scale energy extraction in places where it has never traditionally occurred. Even in Texas, the Fort Worth area is experiencing drilling-related tensions as the build out of the industry encompasses urban settings. Martens has left no doubt that his DEC is working under the threat of lawsuits. The health department review was a recently-added component, in part “to ensure the strongest possible legal position for the Department given the near certainty of litigation,” Martens said in a statement last week. The process will not get any easier. If the debate is reopened for public hearings, the state would be required again to formally respond to comments – an exhaustive process that has previously overwhelmed DEC staff due to the sheer number of responses. Public hearings have also been draws for activists with placards, props, and enthusiasm befitting pep rallies and political conventions. Several Industry representatives expressed varying degrees of confidence that the process would not be delayed much longer. “The failure to complete the rule-making in a time or starting a new one should not be an impediment to moving forward in New York if and when—hopefully sometime in my lifetime—they finally finish the process,” industry attorney Tom West told GNS reporter Jon Campell today. On a final note, the policy decisions and industry reaction must be considered in the context of a glut in the natural gas market that has reduced prices, lowered the amounts of lease payments and royalties to landowners, and eased political pressure to move quickly in New York. Natural gas prices move in cycles with demand, so that could change. Well NYS will be the last Rust Belt State to allow the people to reclaim a future. Predictable. Perhaps this delay will give more people time to wake up to the rapidly accelerating climate change, and realize that frack gas and tar sands are carbon bombs that we can't afford to light. We won't have much of a future with runaway climate change, much less a functioning economy. It's great news that the poor will continue to vote Democrat as they have no other option. This is not a partisan issue. If you breathe air, drink water, eat food grown in New York, you've got skin in this fight. Don't throw it away for pennies made of gas. would like to read what attorney Helen Slottje of CEDC Inc has to say about this. She and husband David Slottje are the state leaders on developing effective community response measures (bans and moratoria) for gas drilling and fracking. Can you get a comment from her for this news item please? "The latest news from the DEC yesterday is very welcome news, particularly to those who have feared that the DEC would be rushed by political pressure, artificial deadlines, and corporate influence. Historically it seems as though the DEC has only provided advance notice of its intentions to industry insiders. So just as important as the fact that the DEC has determined that it will allow the November 29th deadline for rulemaking on fracking to pass (and that the DEC will thereby have to engage in new public hearings and comment), is the fact that this decision was made public a full 60 days in advance of the deadline. When that is added to the recent announcement of the DOH's health impact review, we might be seeing a significant shift in the Governor's attitude about pushing forward to allow fracking in this State. While industry representatives lament the time involved to allow for significant public participation and solicitation of independent scientific research (rather than blind reliance on their assurances of a completely safe history), experience in other states shows the very real possibility of catastrophic long term impacts. In the face of this uncertainty of the full extent of impacts on human health, we believe that proceeding with caution is the only responsible course of action. We are heartened to see a sign that our government officials may be beginning to recognize that the sheer force of industry will is not reason to abandon common sense and sacrifice the future." Thanks for sharing this encouraging news about studying the health impact of hydraulic fracturing. Shining a light on the public health effects is in line with what physicians need, and ask for, to be sure we can live safely in the environment - water, air, soil, food products. As a geneticist, I'm concerned with effects of toxins on us and also on our genes, unborn children, our future. Thanks for the excellent explanation, Tom. I wish that you might have had some time at yesterday's conference for municipal officials and attorneys at Albany Law School to bring the audience up to date on this important timing information; this change in timing makes it much more feasible for local communities to go through the process of updating their comprehensive plans and land use laws to reflect their citizens' vision of the future. I would echo my neighbor Hilary regarding encouraging journalists to quote the voices of others beyond the environmental group-industry axis. Having just finished reading your EXCELLENT book, I know that you have come to understand this issue as multi-dimensional, far beyond the worn jobs vs. environment meme that most journalists try to shoehorn it into. The "well-healed (sic)environmental agencies" that have come to see this as also their fight represent important voices.... and, I am sure, easy ones from which to get quotes quickly. But, the authentic indigenous voices of the people who live here, in rural New York, are often overlooked. When push comes to shove, the big environmental groups may be busy with their other priorities, or unused to the customs and nuances of Upstate life, and miss the boat (or, in Deborah's case yesterday, the train). Helen and David are fighting for their homeland and their neighbors, not just for a principle. As the home rule deliberations advance in tandem with the DEC's more careful studies, the framing of this issue needs to change. This is about whether, as the world deals with climate change and energy-source shifts, New York's relatively rural chunk of Appalachia will join the PA/VA/OH extractive economies, or somehow be able to remain oriented toward education, health care and precision manufacturing, as well as agriculture and tourism. Will the greek yogurt boom, continuing organic agriculture growth, and new Farm Brewery law extend more agriculture and tourism from the Finger Lakes into the more mountainous regions? Or, will the mining towns and culture of Northwestern PA creep North into NY, as well as eastward in PA? What do NYers want our towns to be, and will we decide that, or will we be powerless as the "well-heeled" work it out in NYC and Washington, and maybe Albany? You know us-- give us voice. Thank you. Thanks for this. Yes, I do know well the citizen activists who have been engaged on the front line of this debate, and I will continue to represent their voices. In response to your question about conveying this development at yesterday’s conference – Well, I didn’t have the story yet. I received DeSantis’ answer to the question I had raised for my previous post on my drive home from Albany yesterday afternoon. I stopped at the closest place I could find with wifi – the McDonalds in Oneonta – to post the story and get what reaction I could as the week rapidly drew to a close. In this case, the environmental agencies and industry had been very close to this story, so they were natural (and immediately accessible) sources for first reaction on deadline. That said, I'm keen on the fact that the process will be reopened to the public – a point I emphasize in my deadline report, for the reasons you mention. I’m glad you bring these points up, and I will continue to include the story of grass roots in future reporting. You're the best! You deserve to treat yourself and stop at the Autumn Cafe in Oneonta on the trip back home next time for dinner.... as we did yesterday. Tasty. For my part, I am going to do what I can to build closer communication between the big city lawyers and the regular folk up here in Southern Tier and Finger Lakes. Clearly, the attorneys of Sive, Paget and Riesel, as well as the environmental ngo lawyers, are ready to make new friends with some upstate country-folk. Doubtless we will come to appreciate each others special talents as we get to know one another better. Tom: I am offended by your statement, "Public hearings have also been draws for activists with placards, frippery, and enthusiasm befitting pep rallies and political conventions." I attended many of those hearings and did not observe any "frippery" (which means "gaudy, empty display or ostentation") but, instead, thousands of heart-felt, well-considered 3-minute comments from NY citizens of all walks of life. The large majority of those comments articulated a plethora of adverse impacts of fracking that were omitted from the dSGEIS. They were as abundant and diverse as a medical dictionary's list of ailments. Your statement makes me wonder why you would feel free to disparage the general public like that, while treating elected officials and industry spokespeople with careful respect. Doesn't the power always rest, inherently, with the people? If so, you should applaud every one of those citizens who attempted to stand up to a multi-billion dollar industry. These days, when the corporations have all the rights of personhood without any of the responsibilities of real persons, and when many of our elected representatives are more beholden to the corporations than to us, and when the press is under the sway of commercial interests, then I think it is more important than ever for journalists like yourself to treat citizens and activists with utmost respect. If we are only given a mere 3 minutes each in which to describe how our lives will be entirely ruined by fracking, then "enthusiasm" is to be expected and commended, not construed as "frippery." Anyway, please know I have no intention to disparage, and I disagree with your reading of this. But since it is an easy thing to change without altering my intended meeting, I have changed the word in question. I used the word frippery as defined by Merriam Webster “an elegant or showy garment.” To be clear, I have seen people show up in dinosaur costumes; in PASS GAS IT’S A MOVEMENT t-shirts; dressed as toxic waste barrels; and as 19th Century robber barrens. Yes, they represent a small percentage of activists, but they represent a long-standing tradition of free speech and public debate in this country that I find worth mentioning, and an element that has brought a unique kind of energy to these hearings. As my body of work shows, I am clearly all for people conveying their free speech both in conventional and in creative and attention-getting ways. I have nothing against pep-rallies or conventions, and I think they have an honorable and important tradition in our self governance. I have expressed numerous times that the political nature of the debate – and I include all means of creative expression -- are as important as the science and various scientific interpretations. I disagree with your implication that I am ignoring citizens who embrace a lower-key and less symbolic measures to convey their points. In my blog and in my book Under the Surface, I have respectively devoted pages and chapters to citizens who have earnestly plowed away learning and engaging in the issues while speaking out at hearings and town board meetings, appealing to government officials, and becoming politically active in the debate. So I don’t think it is unreasonable to spend one sentence describing the “pep rally” atmosphere and unique dress embraced by some activists on both sides of the issue. Tom, Fair enough. Since I'm not familiar with your writing, and since I did not observe any costumes at the hearings, I interpreted "frippery" as disparaging. If I'd been one of your regular readers, I probably wouldn't have, as I would have trusted your respect for citizens who speak up. In any case, I'm glad you replaced it with "props," which is neutral, unlike "frippery" which carries the connotation of vanity and flippancy. Again, my Unabridged Random House Dictionary defines "frippery" as "empty display or ostentation." The costumes you describe are far from "empty displays." Quite the contrary! "Reference is made in Section 5.9 to ICF International‘s calculations of the rate at which fracturing fluids could move away from the wellbore through fractures and the rock matrix during pumping operations under hypothetical assumptions of a hydraulic connection. Appendix 11 provides ICF‘s full discussion of the principles governing potential fracture fluid flow under this hypothetical condition. ICF‘s conclusion is that ―hydraulic fracturing does not present a reasonably foreseeable risk of significant adverse environmental impacts to potential freshwater aquifers." Several bullet points follow the paragraph and further detail is cited in the appendices. BUT - I believe NO site specific work has not been done in NYS. And in other US States for that matter. Simply focusing on health affects will only elevate the controversy (e.g. the GMO thing), but won't necessarily restrict drilling. Strictly speaking, health affects/effects issues already assume drilling has begun and gas is in production. And a property owner is drinking his/her well water. So in summary - I recommend focusing on site specific subsurface characterizations at proposed/applicable drill areas. The dsgeis allows for a weirdly short period of time to perform one (which may be optional - I can't tell). Something like 15 to 30 days, maybe. I recommend NYS request a subsurface investigation be performed/overseen by NYDEC and paid for by prospective drillers in currently operating fracking areas such as Pennsylvania. And remember the Marcellus shale in NYS is shallow compared to Pennsylvania. Anyway, this is a great blog. Only if I could write like Tom. I'd be a journalist not an engineer. 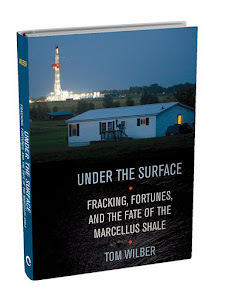 Michael--Have you read Appendix 11, which deals with subsurface migration of fracking fluid? I believe Appendix 11 leaves a lot to be desired. For example, you are correct about the lack of data specific to NY. I question whether Appendix 11 could survive peer review--yet it's a critical part of the SGEIS and is relevant to groundwater safety. And it's an example of a case in which an important portion of the SGEIS was written by an outside agency (in this case ICF) that also consults for the gas industry. One more comment on Appendix 11: Despite its length, I think it reads more like a casual, back-of-the-envelope calculation than a careful analysis of the situation. The whole SGEIS is too speculative and not enough reality such as what to do with the large quantities of liquid wastes. Can't have a business plan without discussing the wastes- it is like buildinga house without a bathroom. I want to clarify something I said earlier--I referred to ICF as an outside "agency"--the word "agency" is probably misleading. I should have said "consulting firm." contracted to Alpha Geological Services, Inc., URS Corporation, NTC Consultants and Sammons/Dutton LLC. Sorry about hijacking Tom’s post in the comments section. Mary, I just skimmed Appendix 11 of the dsgeis. I'm not going to comment on the quality or accuracy since it's based on modeling and assumptions commonly applied to transport of fluids through porous media. Technical reports are sometimes backed up with experimentation before full-scale project delivery. It depends on acceptance of uncertainties. As an added level of certainty site specific physical data could be collected for model input. For instance, transport properties such as porous diffusion, porosity, permeability, etc. can be measured in the laboratory using core samples collected from NYS shale well bores. The measured parameters referenced above can be compared to literature values. Maybe this was done and is in an appendix of Appendix 11 - I'm not sure and maybe site specific data collection is prescribed for well and lease specific permitting. In understanding the subsurface even better, pilot testing a fractured horizontal well could be implemented to collect robust data to compare and confirm the Appendix 11 technical study. Pilot testing may yield environmental and gas production data that both landowners and investors would become curious about. Curiously, there a plenty of wells in Pennsylvania very close to the NYS line that could be studied for environmental and gas production purposes. I believe the USGS is on this issue. Again, for a general EIS the Appendix 11 report seems fine, assuming I skimmed sufficiently. Here are some thoughts on it: 1) the work done in Appendix 11 is mostly specific to fluid migration during initial fracturing operations - not vertical migration of natural fluids (gases and liquids) over the life of the well and post abandonment. 2) Hydraulic fracturing is reported as not necessarily a onetime event - wells may need to get reconditioned and re-fractured upon gas production decline. 3) If I'm not mistaken only the well bore can be plugged upon well abandonment - not the fractures. Is this an issue? Hopefully these issues were addressed by someone and apologies for skimming. Thanks for taking the time to post your thoughts on Appendix 11. I apologize to everyone for discussing this topic at length here, even though it's somewhat off-topic. But I think it is an important issue, and one that may not have received a lot of comments on the dSGEIS or rdSGEIS due to its technical nature. As a general outline of the issue, Appendix 11 probably is fine, but I think its conclusions are heavily dependent on a lot of assumptions that may or may not be correct at specific gas well sites in NY. I know there were other commenters besides me who were concerned about this. For example, the NYC DEP submitted comments noting that natural fractures in the rock could result in hydraulic conductivity values that are "several orders of magnitude greater than those presented in the dSGEIS." And that is a difference that might really matter! In comments on both drafts of the SGEIS, I mentioned issue 2 that you brought up above. I believe a number of commenters mentioned issue 1. I don't know if anyone mentioned issue 3, which is certainly an interesting issue. As I recall, Appendix 11 was analyzing a single stage of fracking at one well. But as I understand it, in actual practice each well would require multiple stages, and there would most likely be multiple wells per pad. And also, as you point out, a well that has been fracked once may need to be re-fracked at a later date when production declines. This would presumably be true for all or most of the wells on a single pad. So I think that the actual situation should be modeled, as opposed to a hypothetical situation in which less fracking fluid is involved and pressure is applied over a much smaller total time. Also as I recall, even Appendix 11 admits that if there happen to be one or more abandoned oil or gas wells in the vicinity of a shale gas fracking operation, then all bets are off. At this point I have very little confidence in the DEC, but I guess we'll see what they come up with when they answer the public's comments. I'm concerned that they are going to group questions/comments together and then address them in a vague and general way, rather than addressing the details. I might need a ruling from Tom on comment cross-talk for his blog. Apologies before hand if I'm taking this discussion too far. To answer your question on contractor/consultants. Pretty much all environmental work for government and industry is done by private contractors with the exception of some government agencies like USGS and Universities. For instance, NYDEC probably contracts much of the work-work to several large firms and either self performs or uses subcontractors. These firms may or may not have industry clientele as well. NYDEC as the project owner acts as manager. Industry does this as well. For instance Exxonmobil will have environmental managers on staff to oversee contractors and consultants to do the work-work, be it thinking or doing kind of stuff. From the dsgeis title page it looks like NYSDEC is the lead agency and lead author. E&E (a consulting firm) seems to be contracted directly to NYSDEC. NYSERDA (public utility or something) assisted in the preparation (but not as an agent like NYSDEC or Fish and Wildlife); contracting URS, ICF, NTC and Alpha (all consultants) to do the work-work. With the exception of E&E maybe, most of the consultants work for both government and industry, which is common. To be honest and thinking out loud here, I'm confused about NYSERDA's role, since they don't seem to be a project owner or state agent. However, they did direct the work performed by several consultants as a lead or major assistant for preparation of the dsgeis. Maybe this isn't all that unusual in NYS for permit procurement for quasi-governmental real estate and infrastructure development, i.e. Port Authority of NY/NJ. I don't know maybe NYSERDA was set up like the Port Authority for natural resource development. Interesting because based on responsibilities listed on the dsgeis that doesn't seem to be the case. I'm lost. Michael, Mary and anybody else reading this, I appreciate the depth of this kind of discussion, and welcome it on this blog. It's refreshing to see the public's command of the issues grow through the review process, and your level of study is a worthwhile contribution to the public knowledge base. Thank you Tom. As I said earlier, I realize that Michael and I have gone off on a lengthy tangent, so I appreciate your welcoming our discussion. In reply to Michael: I understand what you are saying about the use of outside consultants. I'm not sure if this is the very best way to write a document such as the SGEIS, but I do understand that the DEC cannot be expected to maintain a large enough staff with sufficient expertise to do justice to every aspect of every issue that comes along. That being said, I think the public has a right to full transparency, which means that any time the government is using a consulting firm that has a potential conflict of interest (which in this case means having gas industry clients), then that should be very openly disclosed to the public, preferably on the title page of a document like the SGEIS and also on the first page of any report provided by the consulting firm(s) in question. This was not done in the case of the SGEIS. I had to hunt around on the internet to figure out who ICF International was and what clients they serve. Additional thoughts on Appendix 11: I think one of the reasons that Appendix 11 bothers me as much as it does is that its conclusion (i.e. that underground migration of fracking fluids is nothing to be concerned about) is something that the gas industry had assured everyone about over and over and over again. So I guess I assumed that there had been extensive and specific research on this topic and I expected that Appendix 11 would contain some very specific data and a fully developed model or at least some footnotes guiding the readers to one or more fully developed models. Instead, as I said above, Appendix 11 reads more like a back-of-the-envelope approach (not because of its length, but because of its lack of depth), and lacks data specific to NY. It's a simplified, generalized approach, which is fine if what you're going for is a first pass at the problem. But it's not so fine if you're supposedly presenting evidence for why the current and future residents of NY state (including those who rely on sole-source aquifers) should not have to worry about their water supply being ruined by underground migration of fracking fluids. If Appendix 11 turns out to have been falsely reassuring, that will be a very large "oops" with very real consequences for NY residents' health, their property values, and the future of the state. And really, we have to be concerned here about very long time frames, unless we want to leave a terrible legacy to future generations. Frankly, I don't know how much of a problem underground migration of fracking fluid is. I'm not sure if anyone really knows. In any case, I would like to see more convincing evidence than that presented in Appendix 11, particularly since some research (e.g. that of Tom Myers) calls Appendix 11's conclusions into question. The water supply is a lot to gamble with. I think the issues surrounding the question of underground migration of fracking fluid are an excellent illustration of the fact that there's a lot we don't know about the effects of fracking for shale gas in general and fracking for shale gas in NY's geology in particular. While four years may seem like a long time to those who are eager to collect gas royalties, it really isn't very much time at all to study an issue as complex as shale gas extraction. It seems as if a lot of the basic research that should have provided a foundation for a document like the SGEIS simply has not yet been done. understand the lateral and vertical extent of fractures created during the hydraulic fracturing process. "It is prudent that that the location of major zones of fracture concentration and faults be considered in shale-gas drilling and hydraulic fracturing operations to help minimize risks to stratified-drift aquifers as well as bedrock aquifers." I get the impression that some who are eager for permits to be issued think that all of the concerns about fracking are coming from fringe groups, so it's important to note (and to point out to others) that concerns are coming from mainstream sources like the USGS (and on the health front, from multiple respected medical societies, physicians, etc.). As I said earlier, a lot of the the scientific research that should form the foundation for the SGEIS has not been done or has not been considered in the SGEIS. See below for a list of concerns included in the USGS comments. 8) Well water-quality sampling and data base. An interesting issue on natural fractures is discussed in the citation from the DOE paper on Eastern Shale included in the original comment in this thread. In the abstract the authors make it clear that the purpose of hydraulic fracturing is to intercept the natural fractures present in the shale. Basically stating that a majority of the recoverable natural gas resides in the micro and macro fractures. The interstitial pores are too "tight" for extraction be it conventional or fractured methods. This 1981 statement counters more recent statements declaring the shale is relatively free of natural fractures. Thanks for putting this into context. I do agree with Jan Q, though: those signs and protests aren't "frippery" but real people crying out to be heard because the gas industry's millions of $$ drowns out the voices of the people. Thanks for weighing in on this, Sue. See my response to Jan above. It should be noted, as we mount an effort to repeal compulsory integration, that allowing industrial operations on a property violates the owners mortgage terms and home owner's insurance terms. In effect, compulsory integration is state-mandated violation of private contract, resulting in potentially untransferrable risk and unsaleable property. The SGEIS ( Supplemental Generic Environmental Impact Statement) with over 80,000 comments should be withdrawn because the public by now has figured out that NY is no better than other states to not regulate the oil and gas industry professionally-- see here http://www.youtube.com/watch?v=9_fURJ5DCSA. It is documented there that the DEC and the DOH does not have the common sense or basic decency to advise citizens not to drink water that has been tested and proven to be carcinogenic. There are many such incidents that the public experiences but is too reluctant to be videotaped, however, word gets around and the DEC loses the trust of the people. In addition problems have been identified that were not even addressed a year ago such as the 4,800 orphan unplugged old wells , one of these caused a major pollution this year for Shell Oil in Pa during hydrofracking and apparently Shell Oil had not been proactive to first examine if there were any old gas wells lurking near their well pad.http://stateimpact.npr.org/pennsylvania/2012/06/22/as-shell-works-to-stop-methane-neighboring-farmer-worries-about-his-cows/l EPA promised to possibly evaluate this problem in their report in 2014. We ought to wait to read that first. So the SGEIS should be scrapped because the public has lost trust in the competency of the DEC and Gov Cuomo should reform the Mineral Resources Division - that is only 19 people- we should not have to put up with Pataki's appointments..... and he will win the presidency in 2016 if he does not bulldoze over the beauty of this state and ruin the water as well a his own reputation. There is no plan right now what to do with the billions of gallons of complex wastes produced by hydrofracking in Pa let alone NY . The plan now is to offer money to mom and pop household landfills who know very little about radioactivity for accepting radioactive wastes from Pa not NY which the DEC knows legally should go to a specialized low level radioactive landfill- see the end of this testimony of DEC Deputy Commissioner Eugene Leff http://www.youtube.com/watch?v=BxxvvSzKHWs were he admits that the liquid under the Marcellus drill cuttings are too radioactive to go to a household landfill. Reviewing this blog it became evident that New York appears to be at the forefront of the development of regulations regarding hydraulic fracturing and its environmental impact. While issues related to drilling and fracturing have been around for several years it seems like states including New York are late to develop comprehensive regulations that protect the environment as a whole and individuals as the ultimate victims of improperly controlled actions of drilling companies. States involved in addressing regulations include New York, Pennsylvania, Maryland, West Virginia, and Ohio. Reviews of regulatory efforts in these states indicate they are as varied as the number of state themselves. While these states recognize the need for regulations aimed at implementing safeguards to protect property owners, communities, and the environment their approaches are very divergent and represent that there are no comprehensive guidelines. As regulations continue to evolve, companies involved in the industry need to be aware of the ever changing environment that they will be asked to operate under. There will also be a need to strike a balance between regulations and the potential for profit that is important to our economies and the lively hood of numerous potential employees. Other states need to review the efforts of New York and the comprehensive approach they are pursing to ensure sound balance between safety and the potential for economic success. Unfortunately, NY's approach isn't exactly "comprehensive." Some of the topics included in the revised draft of the SGEIS are not covered as thoroughly as they should be. In addition, the revised draft SGEIS did not include an independent health assessment, a cumulative impacts study, or an economic assessment that studied not just the benefits, but also the costs of drilling and fracking for shale gas.